The choice of the right sisal cord brush is to be determined for the respective application in accordance with the customer’s requirements. Our engineers and application technicians with their many years of experience will be pleased to advise you by telephone or at your site regarding a high-quality and cost-effective design of sisal cord brushes for your process. The flexible sisal cord brush consists of an 8-plait sisal cord. The sisal cord serves to avoid grinding strips on the workpiece. While smaller widths are covered by the sisal cord ring (approx. 18 mm width), larger widths are covered by the compact sisal cord brushes, which can be manufactured up to a width of 100 mm. The core can be manufactured with cardboard core or cardboard ring, but also with steel ring insert. In order to obtain optimum results, it is recommended to use impregnations for sisal cord brushes. They greatly improve the service life of sisal cord brushes, the adhesion of polishing paste and the quality of the work result. Basically, it can be said that very hard impregnations are also used when machining workpieces made of very hard materials. For workpieces made of very soft materials, on the other hand, very soft impregnations are also used. 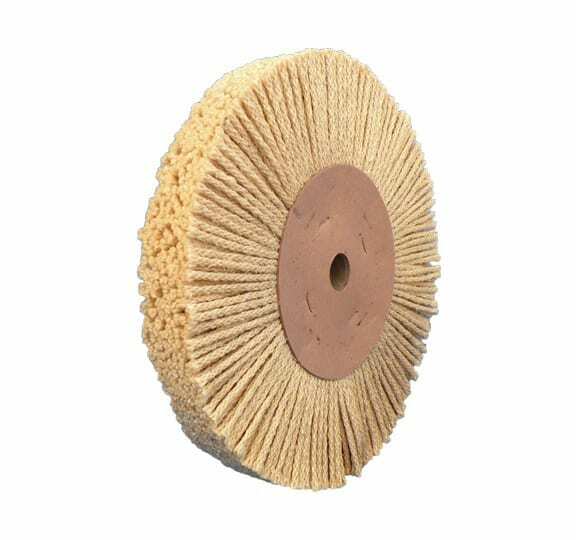 Due to the extreme flexibility of the sisal cord brush it is used for pre-polishing, fine grinding, brushing and matting of flat, slightly and strongly deformed workpieces. The sisal cord brush is mainly used for cutlery, tubes and aluminium profiles. ◊ = Production type, please note delivery time!